Green backgrounds indicate free maps. Blue backgrounds indicate commercial maps. An excellent free resource for maps and map tiles for your VT adventures from Dream Weaved Worlds. Head over to Dundjinni to find oodles of free maps made by the community. Check out the Community Spotlight where some of the more notable submissions can be found. Or head over to the Maps Forum to find maps, maps and more maps! Community maps made with ProFantasy Software's Campaign Cartographer and Dungeon Designer can be found here. More community maps can be found at RPGMapShare. This site also has numerous Tokens and Mapping Objects. A selection of Maps can be found over at The Tangled Web. Maps & Floorplans at the Dragonsfoot site can be found here. Maps made by the community members of RPTools can be found here, here and here. Dungeoneering have fantasy tiles here, modern tiles here and sci-fi tiles here, all complete with placeable objects. Head over to Blu's Cave to find an assortment of maps. Upon these pages you will find a number of maps that feature various encounter areas (dungeon rooms, wilderness ruins, village streets, etc.) all of which have been designed to integrate perfectly with OpenRPG. Scrying Eye Games have some freebie maps available here. Jonathon Robert's has a range of Fantastic Maps at RPGNow, his work can also be seen at his blog. Map Packs and Tile Packs for Battlegrounds can be found here. Map Modules for Fantasy Grounds can be found here. Jonathon Robert's free maps and dungeon tileset can be found at his blog. Free VT compatible maps can be found for Torn Worlds adventures at RPGNow. D20 Cartographer produces One Dollar Dungeons that are VT compatible, with specific MapTool .rpmap files as well. Lord Zsezse Works has a range of maps and tilesets, the newer ones being VT compatible. mappery has thousands of maps from around the world, both old and new. If you fancy some PvP roleplaying, then Conflict Games have a growing range of battlemaps. Tiamat is an on-line Tile Mapper ideal for creating maps for role playing and miniature games. Users can build maps using nearly 3000 tiles designed by SkeletonKey Games and export them to the format and scale of their choosing. Tiamat uses a micro transaction model. Tiamat is FREE to use to create maps. Users only pay when they want to export their maps. The cost depends on the type of export. Miniature scale maps also requires that you purchase the tiles used in the map. Once you buy a tile, you own it, and never pay for it again. Founded by Ben "Superfan" Waxman, Prester's Maps and Charts Emporium is a site dedicated to sharing the work of Goodman Games fans. On this page you'll find beautifully rendered battlemaps for use while playing Goodman Games Dungeon Crawl Classics. All are created by fans, most using the map-making software Dundjinni. DramaScape covers a wide range of digital and print initiatives. They produce a range of generic maps for VTT s and printable maps for roleplaying. They come with both the hex based and square overlays for easy use with miniatures. Bree Orlock Designs Dungeon Maps are 300 dpi .tif images for you to use in your personal or professional projects, subject to the attached license. Art by Bree Orlock. Comes in Color and Greyscale. 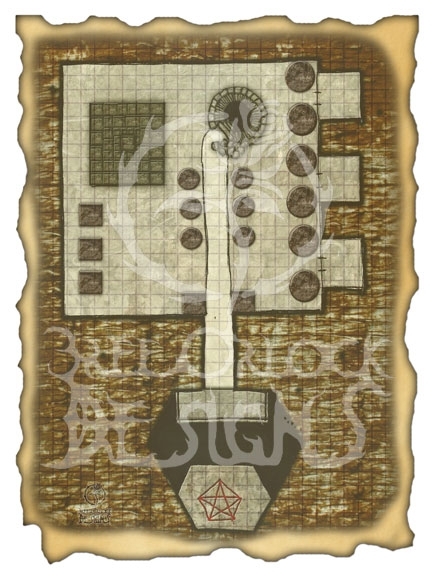 Infernal Titans LLC have a range of battlemaps in .jpg format. Get Ready for the Virtual Tabletop experience you've been waiting for! Savage Mojo is bringing its high art collection to your virtual tabletop! These electronically formatted files are ready and scaled for use on your virtual tabletop. We've provided the files and included instructions for using them with Fantasy Grounds and MapTool, but no matter your engine preference for online play, these will make your online gaming experience better than ever! Each map is created in beautiful high resolution. Use them in Fantasy Grounds, MapTool, d20Pro or any other online tabletop engine. Product contains: Two sets of high resolution graphics files customized for online play, plus instructions for importing those files into Fantasy Grounds and MapTool. GMC has a range of maps, terrain and tokens.